With my brother’s help, I was able to finish up a few projects last month. I was fortunate to get a new Sawstop Industrial Cabinet Saw last year and had been wanting to make a few accessories. After getting inspiration from screwge ( http://lumberjocks.com/projects/74306 ), I added a sliding extension using 1 1/4” telescoping Aluminum tubes with a Maple runner. The tubing was connected to the saw with eight machine screws. We drilled several holes in the tubing and treaded them using a ¼” tap. I trimmed the screws so they wouldn’t interfere with the inner tubing. I added one long screw and the end of each tube as a stop and also to add additional holding strength if it’s fully extended. The runner is made from maple and attached using 1/2” bolts that screw into a piece of solid aluminum square block that was press-fit into each end. I slotted the holes in the maple runner so that I could raise the height 1/2” if I was using my new crosscut sled and needed additional support. The runner can be extended any length up to 48”. The design for my crosscut sled came from Shan ( http://lumberjocks.com/projects/77527 ). I used Kreg’s 3/4” miter gauge fixture bars and their heavy duty Track. It took me several tries to install the miter bars since the screws were installed from the bottom and there isn’t much room for error. After several attempts, I finally got them spaced correctly by cutting a piece of scrap plywood that was the exact width of the distance between the slots. I installed the first bar just using a square. 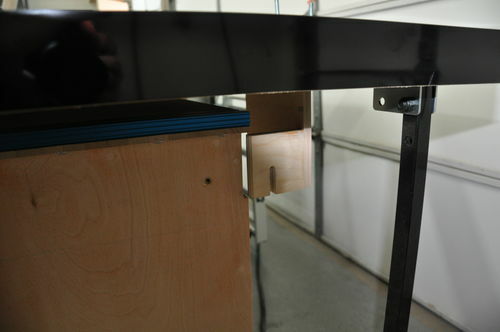 Then using the plywood spacer I was able to align the second bar. I used the 5-cut method to square the back fence. It works great. I went years without a good crosscut sled. Now that I have one, I don’t know why I waited so long because I use it all the time. It’s also a good rust preventer:), since I just leave it on top of the saw when not in use. My last project was a storage cart that I could use to store my saw blades and accessories. I wanted to take advantage of the space under the extension wing, but I also needed it to be on rollers to that I could still move my table saw. Once I made that decision, I decided I could also use it as an assembly/clamp table, so I added the Kreg Klamp traks. The top is made from oak butcher block that was left over from another project. 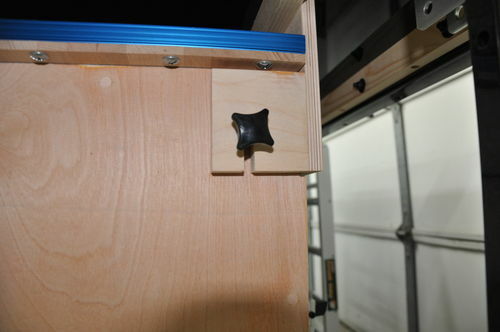 The cabinet is attached using two brackets on the back that are slotted. I added the slots so that I can secure the cabinet (from moving in/out when I open/close the drawers), but still allow the table saw to be jacked-up and moved around (with the cabinet). I would also like to thank Dan ( http://lumberjocks.com/projects/49084 ) for the design inspiration. I like your setup with the saw, roller extention table is very nice for plywood. How do you manage no sawdust on the floor. Nice setup. I need to do this to my Saw Stop!! Sweet about to buy a Saw Stop 3Hp how do you like yours. Man your shop is clean. txn: The Cabinet is attached using a couple brackets that are attached to one of the support boards under the extension wing. 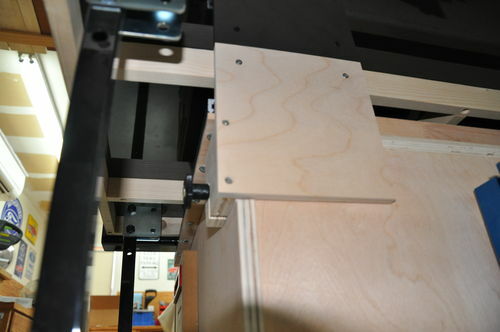 The vertical slots allow me to raise and lower the saw without having to also pickup the cabinet. I used a couple knobs to hold it in, but I keep them loose so they don’t bind up when lifting the saw. To remove the cabinet, I simply remove the 2 knobs and roll it out. To reattach the cabinet, I roll it back in and use the wings on the brackets to help align the cabinet, then I reinstall the knobs. Ken90172: I really like this saw. My previous saw was a Delta 10” Unisaw with a 52” fence which I had for 12+ years. I really didn’t have any issues with the saw, but I started considering the Sawstop when a friend of mine asked to borrow my pressure washer because a friend of his cut-off a couple fingers while installing flooring. I was raised to always respect the power of tools and fortunately, in the 30+ years of using a tablesaw, I have never had an accident like this. However, this accident did make me stop and think. As with most people, my hands are essential to my job (IT Project Manager) and as I get older I’m concerned I could make a critical mistake. I may have initially looked at the Sawstop because of it’s safety features, but I decided to buy it based on it’s quality. The fit and finish is excellent. No vibration. The fence is perfectly square to the blade. I have consistently cut 1 1/2 maple with no issues. My expectation is that I will never need the safety feature, but it’s nice to have the insurance. Very nice work and additions to saw. I’m just starting to reinvent my workshop and these look like great ideas. That outfeed roller area is great. Is that purchased or did you make it? My Laguna Fusion table arrives today. I’m limited to 120VAC. I’d like to use some of these ideas. Mark, this is an elegant version of screwge’s sliding TS extension—I’m leaning toward adapting it to my Craftsman 22124 hybrid. You write “I added one long screw [at?] the end of each tube as a stop and also to add additional holding strength if it’s fully extended”. I’m trying to visualize where that long screw could be located, and how it can function as a stop, assuming the inner and outer tubes are square-profile. Will, the front and rear extensions are the same. I used telescoping aluminum tubes (one fits inside the other). I mounted the outer tube inside the fence tube and the rear was mounted on the angle iron that is used to support the extension wings.